The Key West Butterfly Conservatory is perhaps one of the most relaxing and certainly more beautiful attractions in Key West. As soon as you enter this tropical butterfly wonderland, you'll be treated to a dancing diorama of technicolor as butterflies flit among the lush landscape. The air, filled with the chirping of birds and the sound of cascading water, add to the serene, natural beauty of the butterfly garden. 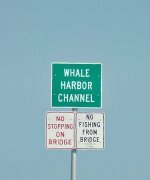 Fully handicap accessible, this is a place where you can spend a relaxing hour, or even a half day, soaking up the sights and smells of this Key West treasure. 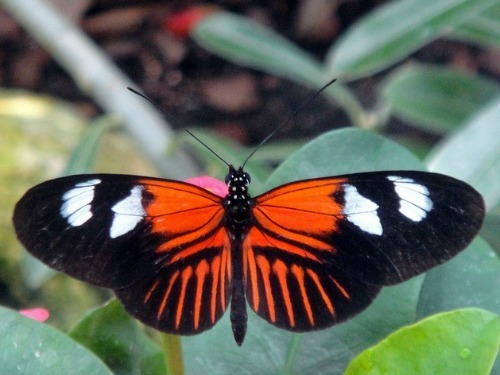 Imported from Central and South America, Asia, Australia, Indonesia, even Africa, the butterflies and birds bring to Key West Florida an additional touch of the exotic and unusual. Unlike the more domestic butterflies that have longer migratory paths, and therefore greater longevity, tropical butterflies are happy where they develop. This translates into short life spans, and these beauties dancing in the air around you, have a surprisingly short life span of only 10 - 14 days. Purchased from butterfly farms located around the world, they arrive in the chrysalis stage. Once they develop, the tropical butterflies live out their short lives in protected comfort before dying barely 2 weeks later. Not only do tropical butterflies have short life spans, they also won't fly until the temperature reaches 80 degrees. 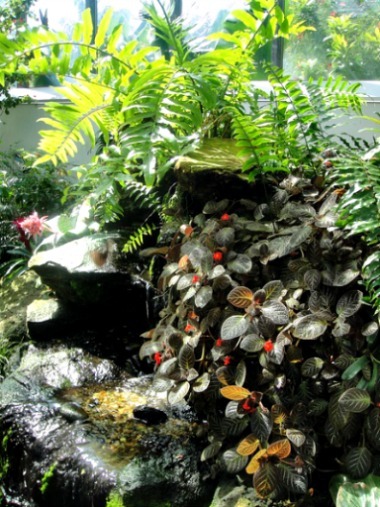 To keep them content and active, the Key West conservatory maintains a controlled environment that mimics the conditions of the tropical rain forests. Inside, you'll find that the humidity is held at a steady 80%, and the temperature hovers in the mid-80's, day and night. For the comfort of their human guests, a slight and gentle cooling air is pumped in, making the rest locations more comfortable for those who wish to sit, and relax. The benches create a welcome place to stop and enjoy the sights and sounds of the numerous species of butterflies and birds. 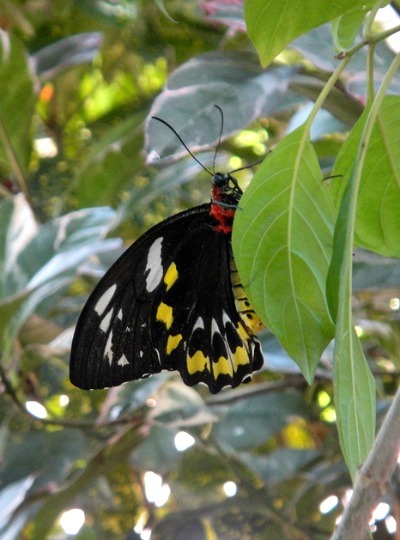 On average the Key West Butterfly and Nature Conservatory is home to approximately 60 species of vibrantly colored butterflies engaged in a variety of activities. Their delicate bodies flutter through the air in their pursuit of food. You'll notice them sitting motionless on broad leaves, their wings spread wide as they relax. If you look up into the trees or at study posts and other structures, you'll catch glimpses of them hanging with their wings closed in tight repose. When not dancing through the air or resting, you'll find them contentedly sampling the sweet nectar of the many flowering plants. You'll also find them happily tasting the juicy goodness of fresh fruit conveniently served up for their dining pleasure by the staff of the Key West Butterfly Conservatory. The universal appeal of these tropical butterflies is their exotic extravaganza of color. Black and white zebra striped patterns and multi-hued peacock shades. Subtle soft diverse pastels, brilliant lapis lazuli, and delicate whites and grays. Vibrant technicolor displays of vivid yellows, turquoises, purples, oranges, greens, and reds. Surrounding you is a mingling of color combinations, lacy patterns and designs capable of successfully competing against any of the spectacularly painted Faberge eggs. 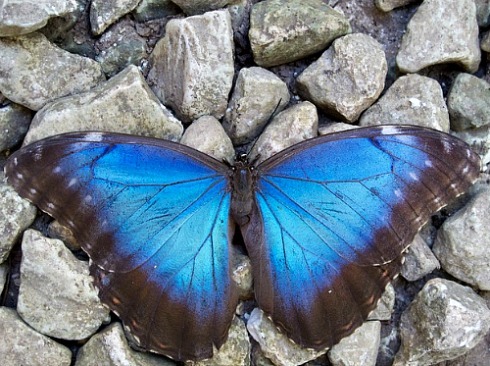 With so many spectacular species it's hard to pick a top contender, but the unofficial signature butterfly, the stunning blue morpho, is the owner's favorite. Not only is the Key West Butterfly Conservatory alive with vibrant flashes of color, the area is lush with tropical vegetation. Ground orchids, chenille plants, fairy dusters, ginger, impatiens, plumeria, ferns, philodendrons, trees and palms blend together, forming the harmonious environment that surrounds you. This cover creates the perfect habitat for the nature Conservatory which is also home to approximately 20 species of tropical birds. With the exception of the yellow canary, all are non-native and include some unusual and interesting bird types. Darting in and around the ground cover you'll spot the beautiful Chinese button quail. The Key West Butterfly Conservatory is also home to several species of the whydah birds known for their long tail plumage grown during mating season. Another spectacular species worth mentioning is the South American dacnis. Babbling streams filled with Chinese koi, waterfalls, and a beautiful gazebo provide the extra element that makes this one of the most relaxing and beautiful Key West museums. After you've spent a leisurely 30 minutes or so inside the Key West nature center, a visit to the Butterfly Shop is a must. Home to a massive collection of butterfly gifts and other collectibles, you'll find wonderful pieces handcrafted from the finest butterflies from around the world. The trophy butterflies, harvested immediately after their death, are in perfect condition. They are then preserved in a variety of interesting reposes and flight simulations in an acrylic medium. These special treasures are displayed on walls around the world, in homes and businesses. They're also the perfect memento of your Key West vacation, or they make a particularly special gift for someone back home. Almost like using a coupon, the entrance fee to this Key West museum can be reduced if you take advantage of buying your ticket online. You'll also avoid the long queue lines that form during peak season, and you'll guarantee yourself entry by purchasing your admission ticket in advance. Your Nature Conservatory ticket is also good all day. You can come and go as often as you please, giving you an opportunity to fully take in everything you see. You also have the option of saving even more money by taking advantage of a combination ticket with the Ernest Hemingway Home & Gardens. This Hemingway home is a Key West museum you don't want to miss. 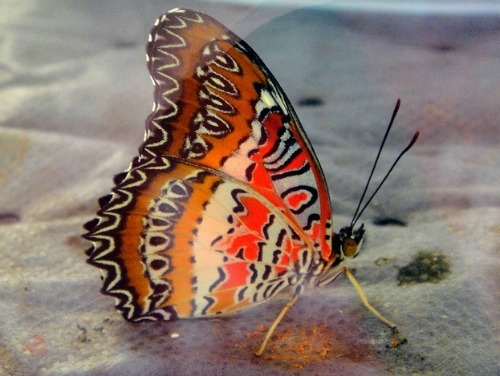 A visit to the Key West Butterfly Conservatory at 1316 Duval Street Key West, will be one of your more enchanting experiences. Don't miss out on the opportunity to be mesmerized by this wonderfully dazzling display of nature's tiny tropical rainbows.